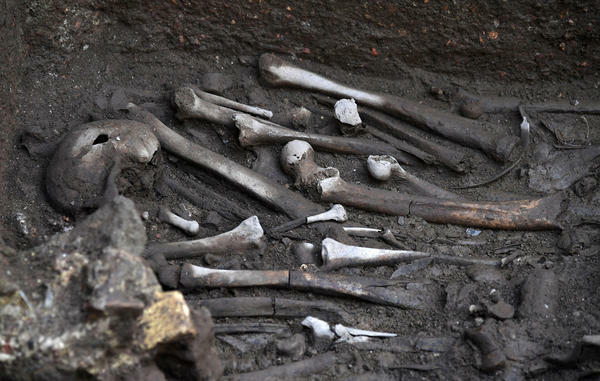 Remains of male soldiers found in Rome. Traditionally, archaeology has focused more on men and male skeletons, like these. But that trend is shifting. "Hours and hours of manual labor that provided the driving force for the expansion of agricultural economies and innovation," says Alison Macintosh, an archaeologist at the University of Cambridge, who led the study. She and her colleagues found that prehistoric women had incredibly strong upper bodies during the early days of farming. On average, their humerus bones — the upper arm bone — were about 16 percent stronger than elite rowers today, who work their arms intensely for 18 to 20 hours each week. The findings — published Wednesday in the journal Science Advances — blow apart the popular perception that ancient women were basically resigned to domestic work around the home. "We suspected that we had been underestimating how much work these women were doing on early farms," Macintosh adds. "It's nice to highlight some of that hidden work." Macintosh thinks archaeologists have been underestimating women's contributions to the agricultural revolution because they were comparing their bones to men's. And they were assuming women's bones change in response to stress and exercises in the same way as men's bones do. "It's easier to see evidence of labor in men bones," she says. "They respond to it in a more extreme way. So a lot of the focus has been on what men are doing." In general, studies of prehistoric societies have tended to focus on men and male skeletons, says Penny Bickle, an archaeologist at the University of York. "This is partly due to the fact that we've assumed men are a stand in for a whole society," she says, "that they are the standard to compare across different societies," she says. Also, men have traditionally been the focus of medical books. "So that has led archaeologists to thinking, 'If I'm comparing an ancient society with modern society, then I need to compare the men.' "
So in the new study, Macintosh decided to do something revolutionary. She focused just on women. She and her team analyzed the strength of 89 shinbones and 78 upper arm bones from women who lived in Europe about 7,500 years ago up until the Medieval age. Then they compared those bones to those of young women in Cambridge, U.K., today, including rowers and runners. Then it became clear. These ancient women had bodacious arms. Their leg bones weren't any stronger than the average women today. But their upper arm bones showed evidence of extreme manual labor — i.e., lots and lots of heavy lifting and repetitive arm motion. "I don't know why we're surprised that women work hard. It's been like this for thousands of years," says Brigitte Holt, a biological anthropologist at the University of Massachusetts Amherst. "Women have always worked hard. It's just not always publicized very well." It's true that women, across the world, often earn little credit or publicity for their contributions on farms. In developing countries, women make up about 40 percent of agricultural labor, the Food and Agriculture Organization reports. 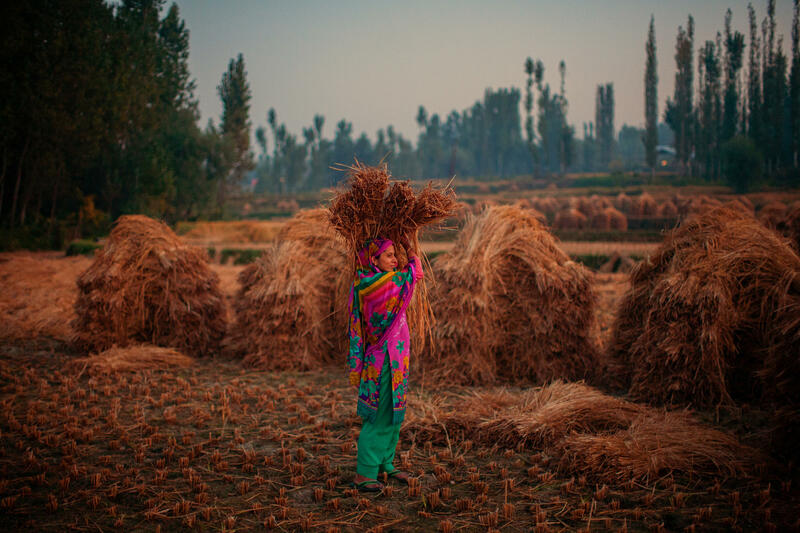 In parts of Asia, women perform nearly half of all farm work. But Holt was surprised by one part of the study: "Just how strong these women were," she says. "The strength in their bones means they were starting this manual labor at a very young age. And that is a big deal." In other words, it wasn't just women contributing to the rise of agriculture. Children were also playing a key role, she says. Overall, the study leaves no doubt that women were working side-by-side men in the fields during early farming, Holt says. And by looking at subsistence farming communities today, she says, you can speculate about what types of tasks ancient women were doing: "Hoeing, planting, harvesting, chopping wood, grinding grain and getting water — and all this while raising small children." So they were really like ancient working moms? "Yes exactly," Holt says. "They're ancient working moms. Things have not changed."